Answer: Thank you for your question! It sounds like you've tried facilitating your son's kicking, and it didn't help him fall asleep to get the rest you know he needs. And your comment about procrastination tells me you are looking for the true goal of his behavior, which is a great place to start. If you look further into what he is hoping to achieve with his actions, you will find that the true goal is deeper than that. The true goal of any child's behavior is always to meet one or more of these Three Basic Needs: 1) power, 2) experience, 3) connection. 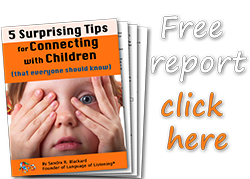 Looking for the need the child's actions are already meeting is a simple coaching tool for getting on your child's side. Your son's hitting, pinching and kicking has elements of ALL THREE NEEDS because what you described are 1) powerful 2) actions directed at 3) you. Kicking the bed instead of you can help him meet his needs for power and physical experience, but since the kicking goes on forever it suggests that the missing element is connection with you. You didn't say if you stay with him while he kicks or not, but if you stay and are simply tolerating the kicking hoping he will eventually lay quietly, he will pick that up, feel like he's wrong, and have to keep kicking to prove he's right about what he needs. Facilitation helps kids meet their needs; disapproval increases their needs. If the missing piece is connection with you, you can help him meet that and his other two needs all at once by getting on his side maybe in an active round of bed kicking that you schedule 30 minutes before reading. During kicking time, you would facilitate his kicking by "calling the shots" and pointing out STRENGTHs as I did in the story I shared in the sample video for my Online Training Center. Experiencing your support instead of your disapproval could facilitate his attempt to meet his needs much more quickly, so watch for him to slow down naturally, then offer (not force) reading books together. AFTER he accepts your offer and settles in, you'll be able to point out STRENGTHs related to self-calming like, "You knew exactly how much kicking you needed to be able to rest." If he adds one or two more kicks, just say, "Looks like there was one more...no two, that you needed to get out. You know how many you need!" Again, your support without resistance, will allow him to stop himself. 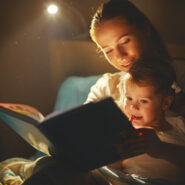 After the books are read, the connection you have built will make it easier for him to say goodnight. Note: If this kind of powerful, active, connective interaction has been missing for him for a while, he may want it more than he wants to read books together, so you might schedule additional time for it (or time with you and a bop bag) separate from bedtime. But after a few nights, don't be surprised if he starts to choose stories more quickly, particularly if connection with you is his highest true goal. Mom's Reply: Thanks! I do always stay with him while he falls asleep, and yes, I typically totally ignore the bed kicking hoping that eventually he will give up and go to sleep (which never happens). I'll see what happens if we schedule kicking into our bedtime routine before reading. He LOVES reading and his entire bedtime routine actually, but just always has the hardest time settling down and going to sleep. My Reply: So glad you think this might help. Please let me know how it goes! Mom's Reply: IT TOTALLY HELPED! We did a little pre-bedtime yoga then bed kicking before stories. And I thought about your point that he probably just wanted more connection at bedtime. I tried to provide that, and tonight has been much more peaceful! Whining: Can You Be Helpless?